First, want to say how much I enjoy your site. Okay, now my story! I’ve been looking (for the last 5 years!) 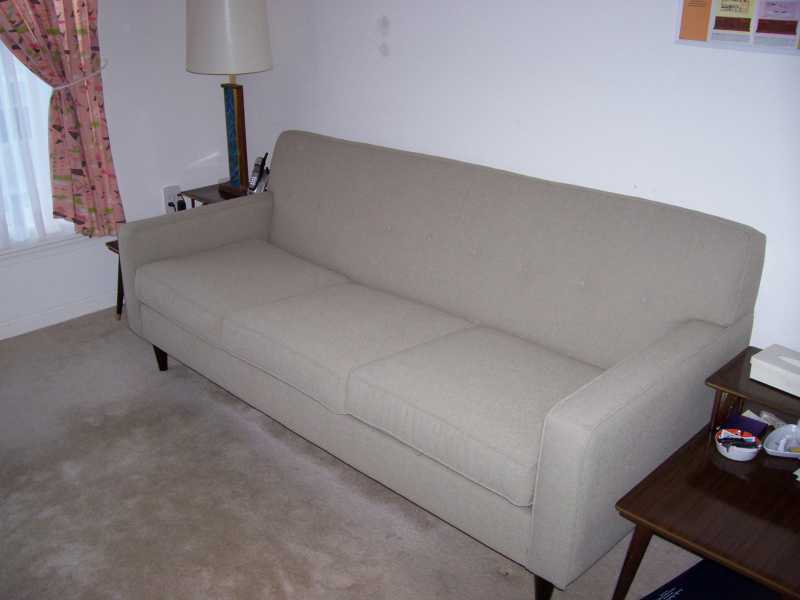 for a suitable mid-century couch for my den. I’d been hoping to find a vintage one, but that never worked out. 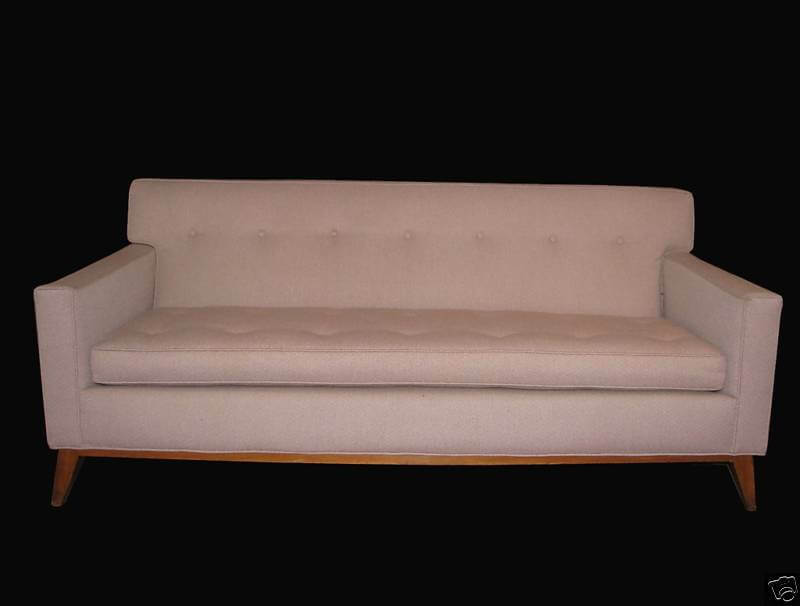 Then, while looking at Design Within Reach, I stumbled across the Bantam Sofa which was exactly what I had been looking for. Unfortunately, their design certainly isn’t within MY reach, so I kept looking. You can imagine my surprise when I came across an almost identical sofa at Macy’s, of all places. It’s called the Corona, and I just got mine about 2 weeks ago. Not only is it stylish and comfortable (great for naps! ), it’s well made and someone said it “looked like it was stolen out of Rob and Laura Petrie’s living room!” That’s exactly the look I was going for! The good news about this sofa is the price. The Bantam is $1750.00. I got my Corona on sale for $630.00 (it’s almost always on sale.) It’s available in several colors, most of which I found unappealing. I got mine in “stone” which is basically gray. Thanks for the great site and all the great ideas! Thanks, Bob! Great sofa, very nice lines! And I love how your gray sofa looks with those pink curtains. Pink-and-gray is a great color combo! Personally, I also like the Paprika (orange-red) color offered for the sofa, but then, burnt orange is my favorite color. Bob's grey example. He points out that it's hard to see the button tufting, a great feature, in this photo. 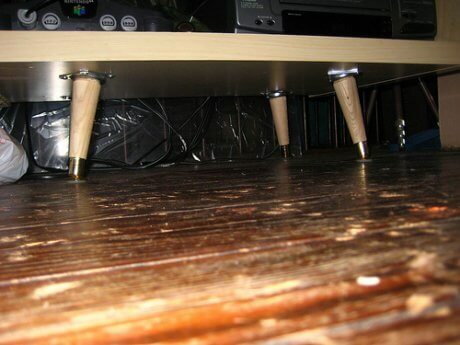 And says: "Also in the picture, you can see a bit of my step end tables and what I think may be a Harris Strong lamp. My den is very much a work-in-progress, so please pardon the patched plaster!" I’m frantically trying to decide if this is the sofa for me before the sale ends. Scared to go too light, scared to go too boring, scared of choosing a color. My walls are a pale beigey yellow and I have a dusty pink sitting chair….the rest of the room has splashes of orange and blue. Someone tell me how to choose the color!!! Accent pillows? Throws? Or just let the piece speak for itself? Confusion….also, worried about the wearing…hm. Christa, sounds to me like you should choose the sofa color that appeal to you… then adjust your room around it. Suggestion: Make yourself a mood board. Take pictures of your LR either as one shot or een better, piece by piece … take screen shots of the sofa in each color … then put them together on Power Point; that’s what I do. When you see the various colors together, this might help you eyeball what works best. And, don’t be frantic: I tend to think: There is ALWAYS another sale at Macy’s. I’ve been looking for a blue sectional for 5 years! Blue is everywhere in mid-century modern homes, magazines, etc. But I cannot find a blue couch/sectional for sale. 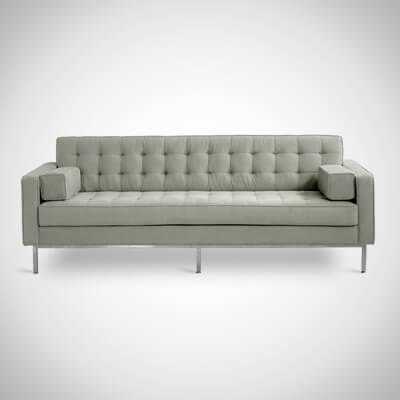 Perfect world, I would love a Contemporary or Modern sectional in blue leather!